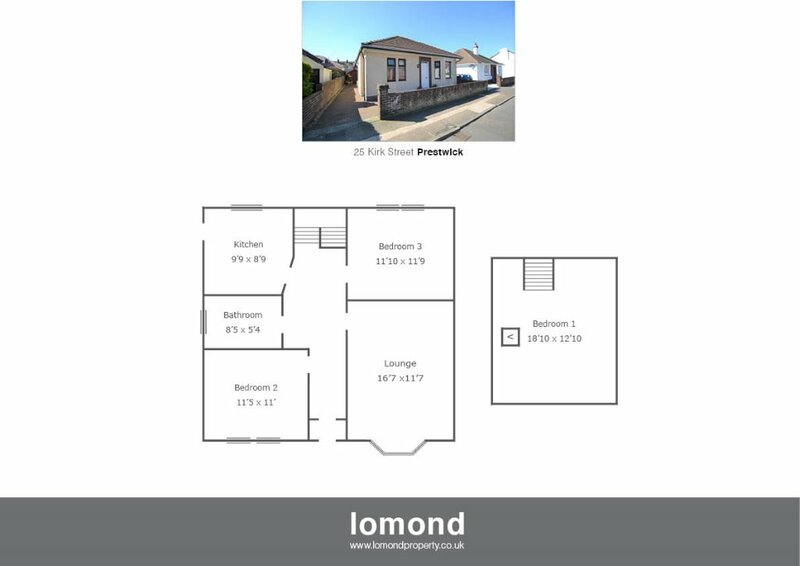 Situated in the heart of the town centre in a popular residential area, 25 Kirk Street is a rarely available detached bungalow comprising three bedrooms(over two levels), lounge, kitchen and family bathrooms. Externally the property comes with easily maintained south facing rear gardens, and mono bloc paving to the front and side. In greater detail the ground floor extends to an entrance vestibule leading to the spacious and welcoming hallway with stairs to the upper level. The front facing lounge is well presented with feature bay window, and neutral colours throughout. There are two double bedrooms on the ground floor, one currently used as a dining room. The modern kitchen comes with floor and wall mounted units, integrated electric hob, oven and hob. The modern bathroom comes with bath, WC and WHB, all finished to neutral tiling. The upper level houses a further double bedroom, with velux window and access to the eaves for storage. The property benefits from gas central heating, and double glazing.